The 2014 Porsche 911 GT3 is the most powerful normally aspirated version of the seventh-generation 911 that debuted for the 2012 model year. Engineered to be as light as possible, with as little unsprung mass as possible, and to deliver as much horsepower as possible without resorting to supercharging or turbocharging, the rear-drive 2014 911 GT3 is about as close as it gets to a track-ready Porsche 911. Unique front and rear styling sets the 2014 Porsche 911 GT3 apart from other 911 models, in no small part due to the large rear wing with adjustable mounts. The 911 GT3 is 1.7 inches wider than a Carrera S model at the rear, and incorporates exhaust vents in the rear bodywork. 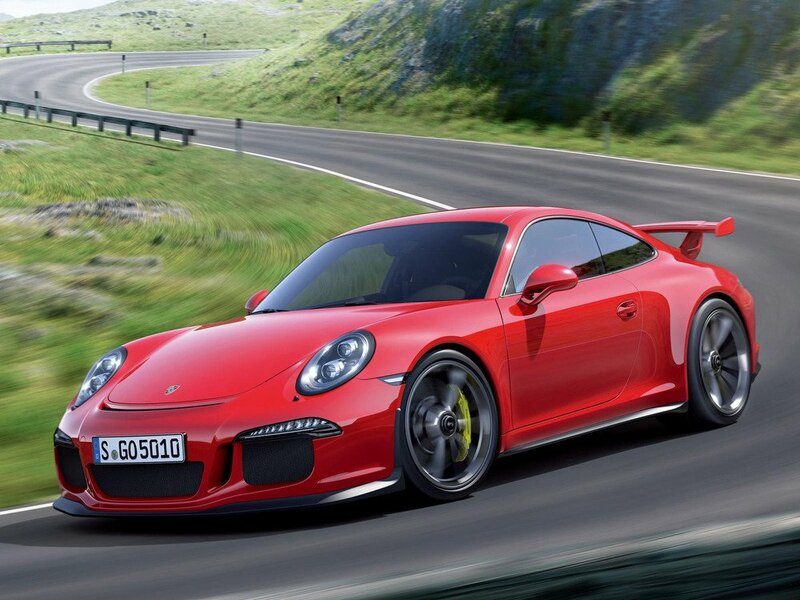 Porsche says the 911 GT3's coefficient of drag is 0.33. A set of 20-inch forged aluminum wheels with locking center hubs is standard, with 245/35 front and 305/30 rear performance tires. In a first for Porsche, the GT3 is available with full LED front lighting. Porsche divulges no official details about the GT3's interior or what options will be offered for the vehicle. Photographs depict extensive use of microfiber suede for the seat inserts, door panel inserts, headliner and pillar covers, center armrest, steering wheel, and lower dashboard panels. Leather is employed for the seat bolsters and headrests, and an extended leather treatment is used for the upper portion of the dashboard, featuring contrast stitching. 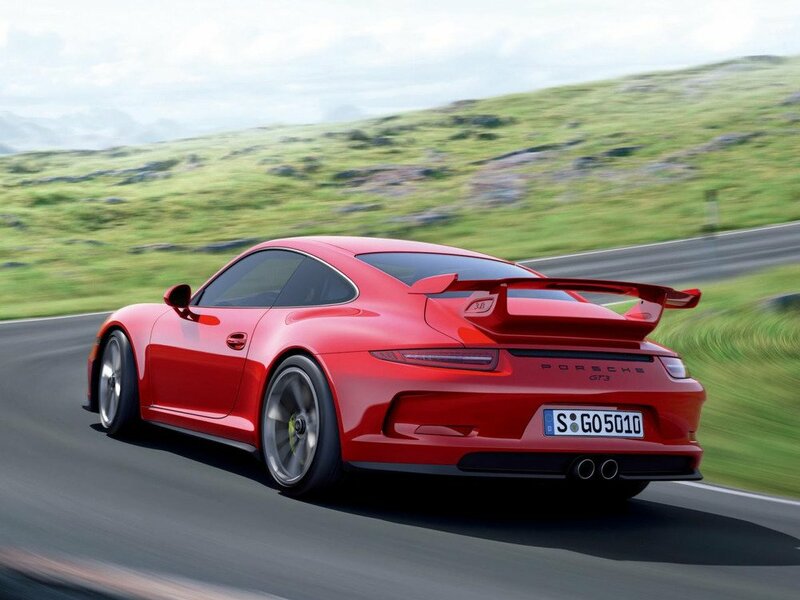 The 2014 Porsche 911 GT3 model's direct-injection, horizontally opposed, 3.8-liter 6-cylinder engine is designed to reduce as much reciprocating mass as possible, according to the automaker. The normally aspirated engine is rated to deliver 475 horsepower at 8,250 rpm and 324 lb.-ft. of torque at 6,250 rpm, is equipped with a 12.9:1 compression ratio, and boasts a 9,000 rpm redline. According to Porsche, the 3,152.6-pound sports car accelerates to 60 mph in 3.3 seconds, achieves a top speed of 195 mph, and laps the Nurburgring Nordschliefe in less than 7.5 minutes. Key engineering elements include forged pistons, new cylinder heads with large intake and exhaust ports, new valve gear, and titanium connecting rods. The GT3's direct fuel-injection system is designed specifically for this model, and it is equipped with dry-sump lubrication, improved engine cooling, dynamic engine mounts, and a sports exhaust system equipped with the ability to reduce backpressure with the touch of a button. A 7-speed Porsche Doppelkupplung (PDK) transmission is standard, which might be upsetting to fans of a traditional manual with a clutch pedal. Know, however, that the GT3's PDK is based on a racing gearbox, and is equipped with shorter gear ratios, closer gear spacing, and quicker shifts. Porsche says it has improved tactile feedback with the shifter paddles, and with this PDK the driver can pull back on both paddles to put the car in Neutral gear. When both paddles are released, the vehicle's clutch re-engages. Alternatively, the driver can execute manual shifts using the gear selector itself, or can opt to use the GT3's adaptive transmission control system to execute gearshifts. The new 2014 Porsche GT3 rides on a chassis that's lowered by 30mm, and the sports car offers revised front and rear suspensions with standard Porsche Active Suspension Management variable damping, Porsche Torque Vectoring Plus with selective braking and a fully variable electronic locking rear differential, and larger brakes with composite brake discs, 6-piston front calipers, and 4-piston rear calipers. The 2014 911 GT3 is the first Porsche to have active rear-wheel steering, which allows the rear wheel steering angle to vary by up to 1.5 degrees. At vehicle speeds under 31 mph, the system steers the wheels in the opposite direction of the front wheels, shortening the vehicle's wheelbase by a virtual 5.9 inches and reducing the vehicle's turning radius for greater low-speed maneuverability. Above 50 mph, the system steers the rear wheels in the same direction as the front wheels, resulting in a 20-inch virtual wheelbase extension, thereby enhancing stability.